While on vacation, I was able to finish my second Yomut sock from Silk Road Socks. Lorna’s Laces in the Tickled Pink colorway is very pretty. 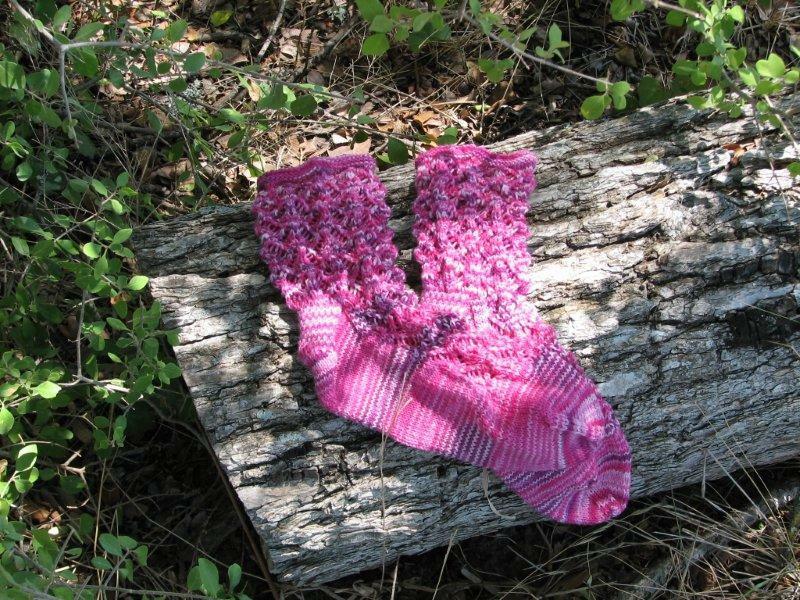 It seems that if you finish one sock, and you try to make a matching sock and you do not have the first sock with you, you should have written down how many pattern repeats you’ve done on the first sock or when you try to finish the second sock, you might end up with one too many pattern repeats. This MIGHT happen… or you might be one of the lucky ones that gets it on the nose. I was not. I struggled while on our trip trying to figure out how many repeats I’d done on the first sock, but I was torn, and I guessed wrong. oh well. I spent one movie ripping back and the next movie reknitting and the third movie in a row, I cast on for another pair of socks. Hi, my name is Katie and I watch A LOT of movies.